On Thursday night, June 26, 2007, the following message was placed on an Islamic website chat room called El Hesbah by Abu Osama al-Hazeen. Today I say: Rejoice, by Allah, London shall be bombed . 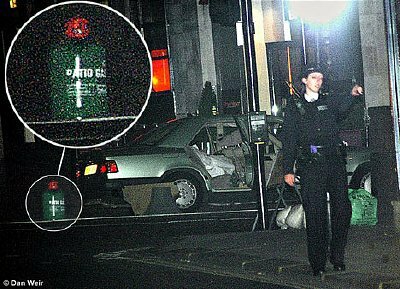 On early Friday morning, June 27, 2007, just after midnight, two Mercedes cars each rigged with a car bomb composed of 60 litres of gasoline, propane cylinders and nails were parked in London's West End, one in Haymarket, just outside the nightclub Tiger Tiger, and the other on Cockspur Street, near to Trafalgar Square. In the early hours of Friday morning, these locations are among the busiest parts of Central London. People are leaving nightclubs, restaurants, bars, cinemas, and theaters after an evening out. Islamist extremist literature, found on the internet and heard in radical preaching, has singled out night clubs as examples of the immoral hypocrisy of countries like the UK. The first of these cars was discovered by chance. After midnight, two paramedics were called to the Tiger Tiger club to treat a man who had fallen and had a minor head injury. When they arrived they noticed the Mercedes car with the smell of gas coming from it. First they treated the man, then they called the police and fire brigade. When the officers arrived, they disconnected the cell phone effectively defusing the car bomb. 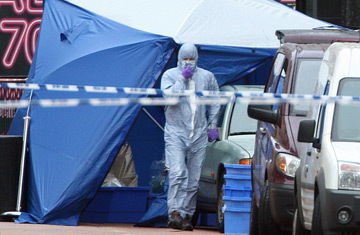 They removed the visible explosive items, put a tent around the car, and began forensic investigation. By morning when it was light, they towed car away. The second car was illegally parked on Cockspur Street near Trafalgar square. It was ticketed. About an hour later it was towed to the Park Lane pound. It was there that the smell of gas was noticed. Upon investigating the smell, it was discovered that this car too had been rigged with a bomb of gasoline, propane gas cylinders, and nails. Telephone records indicate that the terrorists called the cell phone in the Mercedes parked by the Tiger Tiger night club twice. But the cell phone failed to denotate the fuse of the bombs. They also called the cell phone located in the Mercedes parked near Trafalgar Square four times. This cell phone also failed to denotate the fuse of the car bomb. From the cell phones found in the cars, the police were able to trace who had made the cell phone calls. Amazingly, this lead to a group of young doctors, all Muslim. One of them had a known connection to an Al Qaeda operative currently serving a jail term in Great Britain for terrorist activities. We chose for our key words London, Doctor or Doctors, Terror or The Terror, Attack, Al Qaeda or The Qaeda, and the month of Tamuz, which is the Hebrew month in which the June 27, 2007 date occurs. This is the date that the bombed rigged cars were discovered. The selection of these key words is a priori . We explore, not quite systematically, groups of three key words at a time, with one of the key words being London. We show the significant tables. The first table we explore is with the key words London Doctor and The Terror. 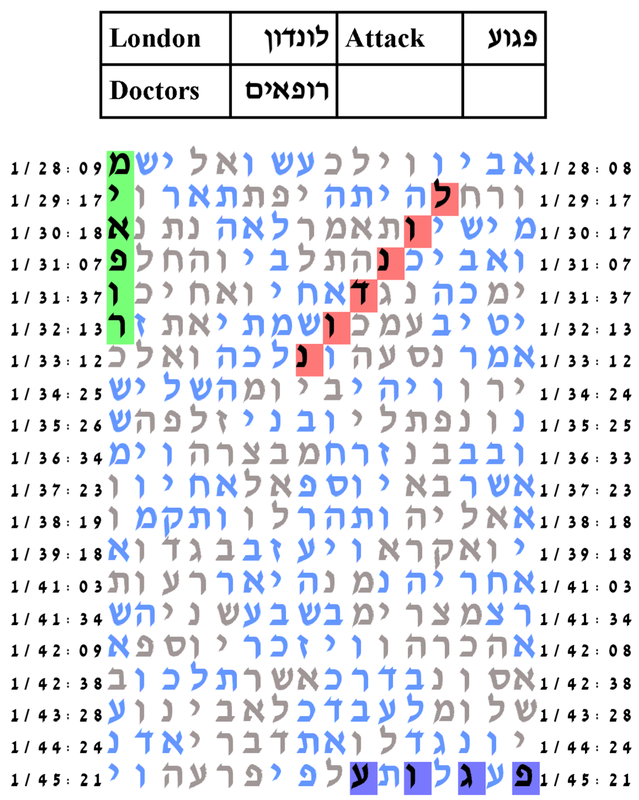 With the expected number of ELSs set to 10, the probability that a text from the ELS random placement text population would have as compact an area table as that produced by the Torah text is 4.5/1000. The expected number of ELSs is set to 10. The cylinder size is 62 columns. The probability that a text from the ELS random placement text population would produce as small a table as this is 4.5/1,000. The second table we explore is with the key words London, Doctors, and Attack. With the expected number of ELSs set to 100, the probability that a text from the ELS random placement text population would have as compact an area table as that produced by the Torah text is 14.5/1000. The expected number of ELSs is set to 100. The cylinder size is 1624 columns. The probability that a text from the ELS random placement text population would produce as small a table as this is 14.5/1,000. The third table we explore is with the key words London, Doctors, and Attack. However, unlike the previous table, the key word Attack is fully spelled פיגוע. Thus this represents an instance of redundant encoding. 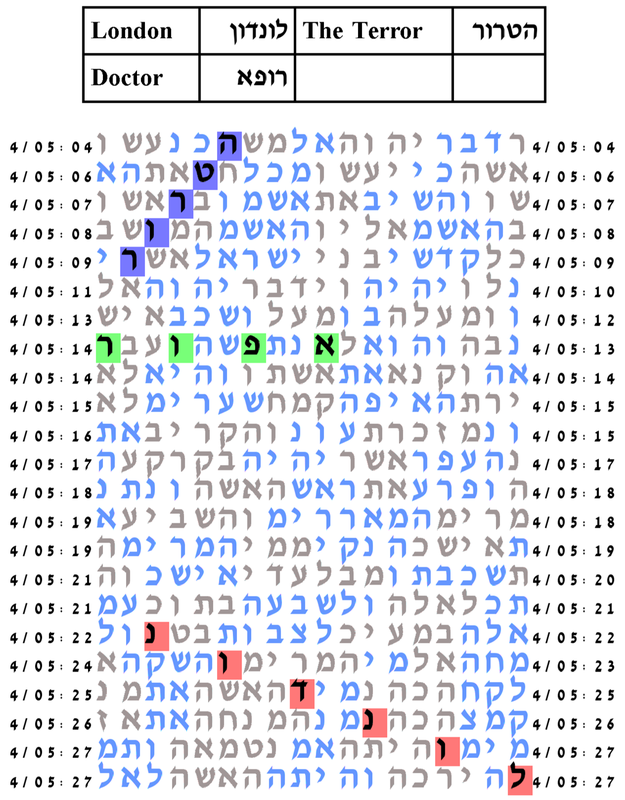 With the expected number of ELSs set to 60, the probability that a text from the ELS random placement text population would have as compact an area table as that produced by the Torah text is 88/1000. The expected number of ELSs is set to 60. The cylinder size is 445 columns. The probability that a text from the ELS random placement text population would produce as small a table as this is 88/1,000. 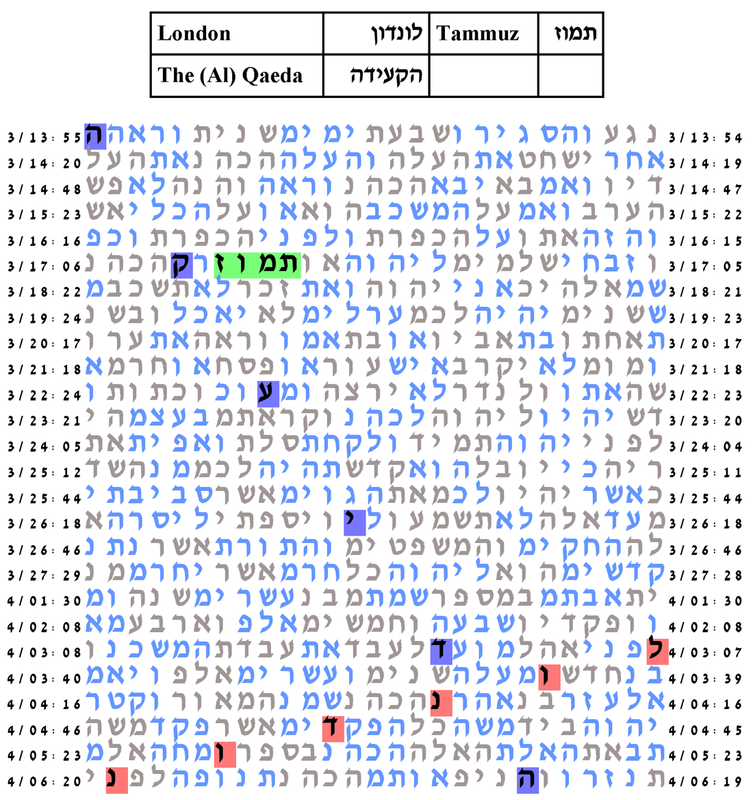 The fourth table we explore is with the key words London, The (Al) Qaeda, and Tammuz. With the expected number of ELSs set to 50, the probability that a text from the ELS random placement text population would have as compact an area table as that produced by the Torah text is 70/1000. The expected number of ELSs is set to 60. The cylinder size is 1484 columns. The probability that a text from the ELS random placement text population would produce as small a table as this is 70/1,000. The fifth table we explore is with the key word London, The (Al) Qaeda, and The Terror. For this group of key words we alter our usual protocol and raise the maximum row skip and maximum column skip from 10 to 30. 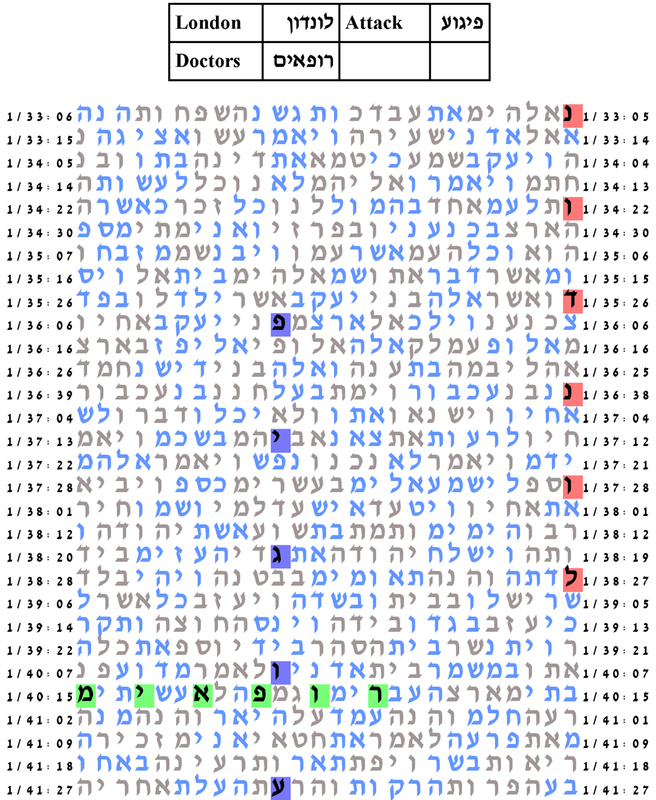 With the expecte dnumber of ELSs set to 30, the probability that a text from the ELS random placement text population would have as compact an area table as the one produced by the Torah text is 32/1,000. The maximum row and column skip is set to 30. The expected number of ELSs is set to 30. The cylinder size is 1302 columns. The probability that a text from the ELS random placement text population would produce as small a table as this is 32/1,000.